It's a beautiful day here in Wellington, New Zealand. Yesterday I saw Madeline Olnek's Co-Dependent Lesbian Space Alien Seeks Same at the Out Takes Film Festival, before the launch of Lawrence Patchett's wonderful I Got His Blood On Me at Unity Books. At lunch time, I'll be back at the Paramount to see Erin Greenwell's My Best Day. And then I'll spend the afternoon in the Teju Cole masterclass at the International Institute of Modern Letters (yep! *huge* privilege). As Jill Livestre said last week, in her podcast on Out Takes: 'We're everywhere and we go everywhere'. Discrimination against women storytellers and against single mothers inspires most of my activism, and I tend to take my comfortable place on the LGBTI spectrum for granted. But this morning's emails brought a disturbing press release from Manny de Guerre at the Side by Side LGBT Film Festival, currently in Novosibirsk. I acknowledge that I have become complacent, and am spurred to action. Here's the press release in its entirety. Lynch Mob Like Tactics From Homophobic Youths and Inadequate Police Protection Force Side by Side LGBT Film Festival to Cancel the Third and Final Day of the Event in Novosibirsk. On the second day of the Side by Side LGBT Film Festival in Novosibirsk organizers and audience came under serious threat from a homophobic mob of aggressive youths. The youths, numbering around 30 or so in total, had surrounded the shopping centre where the screening was taking place in a multiplex on the fourth floor of the building. Prior to the start, during and at the end of the event the youths gathered around the screening hall, shouting insults and it was clear from their discussions with each other and behavior that they were intent on violence. 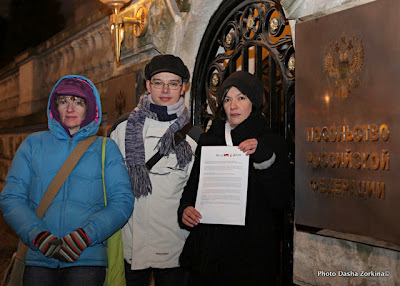 Organizers of the festival complained multiple times to the police, who were in force but outside the building overseeing a picket in support of the homophobic law that has its second reading in the local Novosibirsk parliament today, 7th June, 2012. The youths, eventually on the request of the police, left the multiplex only to return however within minutes and again begin hassling organizers. This pattern was repeated throughout the entire period of the event. Failing entirely in their duties and the attempt to maintain effective public order and safety the threat of violence and danger to both audience members, volunteers and organizers was imminent. At 21.00 when the screening came to end the mob of youths had gathered outside the building. Transportation was organized for both audience members and organizers. Security guards escorted visitors of the festival to their awaiting cars and taken away safely. Last to leave were the festival organizers. An attempt was made to smash the rear passenger window of the taxi. The youths had organized cars and a motorcycle to follow the organizers and police took no measures to stop their pursuit. It was only the high speed driving skills of the taxi driver that the organizers were able to escape without being followed. In a conversation with festival director Gulya Sultanova, one of the police heads stated: "Why have you circulated information about your festival? I don't plan to be here tomorrow and protect you." Police indifference and their lack of concern to protect peaceful, law abiding citizens from violent thugs has forced the festival organizers to cancel today's screening out of reasons of safety. The Novosibirsk film festival is the second of three to take place this week in Siberia. Last weekend the festival came up against the similar problems in the city of Kemerovo. The final festival is to be held in the city of Tomsk 8 - 10 June, 2012. In 2011 the festival in Tomsk was banned by the authorities. It remains uncertain what the forecast will be for tomorrow's opening. Organizers are monitoring the situation and have already increased security at the opening. This clip shows and tells more about the Side by Side festival. I was touched to see Zanele Muholi speaking in it, whose film Difficult Love I saw in Out Takes last week. And what about the homophobic legislative changes that the press release refers to? 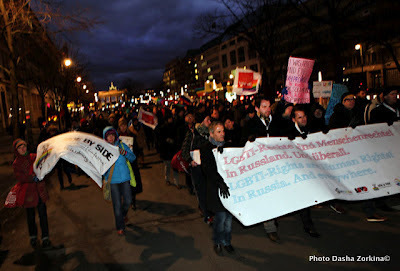 According to the notes on YouTube, on 16 November 2011 the Saint Petersburg Parliament began to discuss the possible introduction of administrative changes, which equated homosexuality, bisexuality and transgender with pedophilia, as well as impose a fine for public discussion of LGBT issues, treating it as 'propaganda'. The adoption of this law will have a detrimental effect on the whole of the Russian LGBT movement, including Coming Out, the only interregional LGBT organization Russian LGBT Network, the largest grassroots LGBT organization. The Side by Side LGBT Film Festival and other LGBT groups are headquartered in St. Petersburg. The proposed amendments violate both Russian and international law, as well as the European Convention of Human Rights. Organizations behind the protest campaign are Memorial, The Human Rights Council of St. Petersburg, Civil Control, Amnesty International, Human Rights Watch as well as many others. Here's another clip, about the law change. In New Zealand, we can stand side by side with the LGBT community in Novosibirsk and other communities in Russia, through protest to the Embassy of the Russian Federation (closed for holidays 11-12 June, so today is good). The Ambassador's name is His Excellency Mr Andrey Tatarinov. If you're reading this from outside New Zealand, please feel free to add details about your protests. More solidarity in Berlin, February. Thanks to Dasha Zorkina for the photographs. Disturbing, but much to be done to stand in solidarity, and I know the festival organizers and supporters are very busy fighting this injustice! Thank you for posting this!